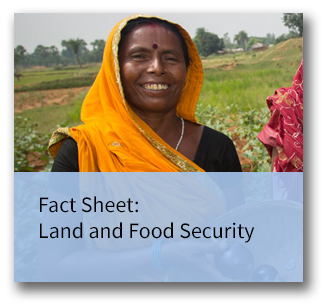 Successfully linking property rights with food security helps households, farmers, and businesses obtain access to property rights, resources, and markets to improve food production and/or consumption. The relationship between land tenure and resource rights and food security may be direct (e.g., securing property rights in land or improving land access thereby enabling investment of land, labor, and capital in food production); or indirect (e.g., selling agricultural produce for sale or securing property rights for businesses that provide wages, earnings, or income that enable farmers, owners, and workers to buy food). Effective land governance systems that provide improved access and rights to land resources are a necessary condition for achieving food security and better nutrition. In some situations particular individuals or groups may have difficulty accessing land and land markets, which limits their opportunity to acquire rights and put those rights to use. Providing secure access can, therefore, be a condition precedent to providing clear, secure and negotiable rights. Effective governance systems create positive incentives that enable more efficient and effective investment in land, labor, capital, and improved practices in food production and nutrition. More secure land and property rights also often create opportunities for rights holders to negotiate voluntary transfers of valuable resources for their economic gain.